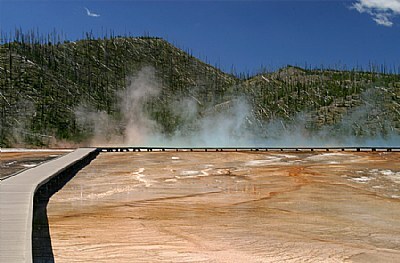 Image Title: Grand Prismatic Spring "B"
Location City - yellowstone n.p. About i need advice for choose what crop is better for this shot:pano or normal? Great angle shot dear Davide! I agree with you that this photo would benefit from a crop, but, comparing this one to the panoramic photo, I think the use of the photo also plays an important role. 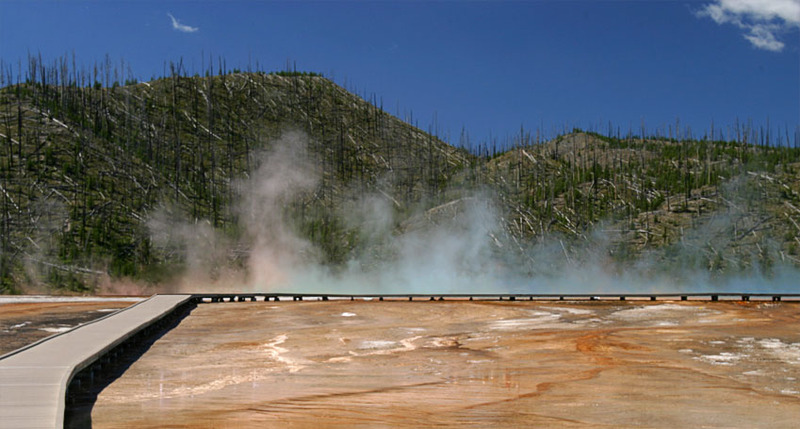 This one shows a bit too much of the geothermical muds, yet the pano format one consises the view just a bit too much. I think the best way to crop it lies somewhere in between. But this only applies to a normal version. I think the 2:1 ratio for the UF panoramic feature is a mean, not a purpose, and although the large size image would allow you to show more of the details (if you had enlarged it to say 1200 x 600 px), but the image is just too tight. I think the rule of thirds would be an ideal solution. Approx. app. of rule of thirds. Ciao Davide, preferisco questa come composizione rispetto al taglio panoramico, ti fa entrare maggiormente nella scena. Ne ho anch'io di foto della Grand Prismatic, magari appena ho un attimo le posto. un saluto!